Is this mug the work of Roger Brittain? Big ask I know. I have not even seen a mug by Roger Brittain. I am making a connection purely on the similarity of the glaze/s and the decoration. At first glance the combination of brown and black looks like Tenmoku but I think it is something different. As for the pattern, because I do not know the glaze or glazes I cannot tell whether it is a resist, wipe-off, or brush on, but as the black is raised above the brown I think it unlikely to be brushwork. I have shown details of the handle. This is all very deliberate so it might be recognisable as someone's individual style. I see that the finishing of the handle end is also the same as that on the second tm piece. $1 mug from Arkrights, Dargavlle couple weeks ago. I like. The glazing technique is called Wax Resist on both of those pieces though different glazes have been used. 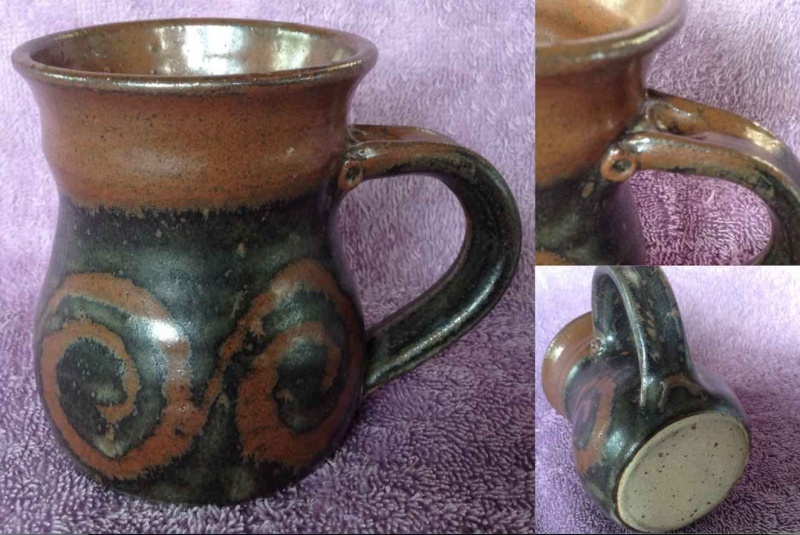 The pot is dipped into a glaze and the a pattern is drawn onto the pot with hot wax. Then the pot is dipped into another contrasting glaze and where the wax pattern is it resists the 2nd glaze. The wax burns out in the glaze firing and leaves a subtle contrasting pattern. I don't see any other similarities with these two. The 'dots' of clay at the top of the handle will be a form of identification, you just have to find some more. No, I can't lay claim to that one although I made many in my time. I'll look forward to finding one of yours in the future.